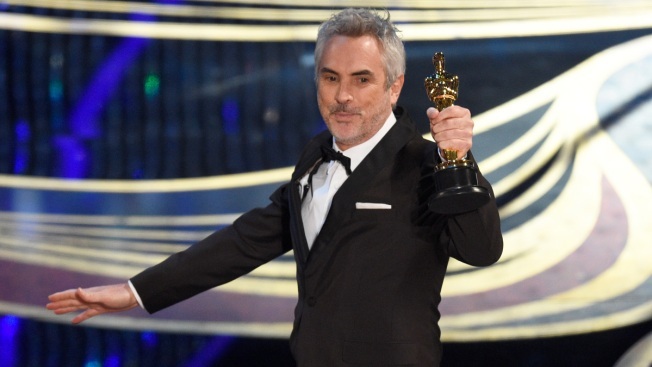 Alfonso Cuaron accepts the award for best cinematography for "Roma" at the Oscars on Sunday, Feb. 24, 2019, at the Dolby Theatre in Los Angeles. The touching black-and-white drama "Roma" that follows a domestic worker for a middle-class family in 1970s Mexico City won the Oscar for best foreign language film Sunday. Director Alfonso Cuaron's deeply personal film with dialogue in Spanish and Mixtec gave Mexico its long-sought statuette in the foreign film category. The Netflix-produced film was inspired by Cuaron's own youth. The story develops in the midst of the turmoil that rocked Mexico in the early 70s, including the student demonstrations that in 1971 led to a massacre by a group backed by authorities. Society is fraying and the women of the house seem to take the brunt as they try to keep the family of four children afloat. The film beat four other contenders that also told the stories of individuals and families facing tumultuous social and historical times. The other nominated films were Polish filmmaker Pawel Pawlikowski's 20th-century romance "Cold War;" German director Florian Henckel von Donnersmarck's artist biopic "Never Look Away;" Japanese filmmaker Hirokazu Kore-eda's's subtle family story "Shoplifters;" and "Capernaum," a powerful neo-realist drama about a Syrian child refugee from Lebanon's Nadine Labaki. The foreign film statue is not given to a specific individual, but to the nominating country. Eighty-seven countries submitted movies for consideration this year. Mexico has competed for the trophy eight other times, most recently in 2011 with "Biutiful" by Alejandro Gonzalez Inarritu, but had never won.